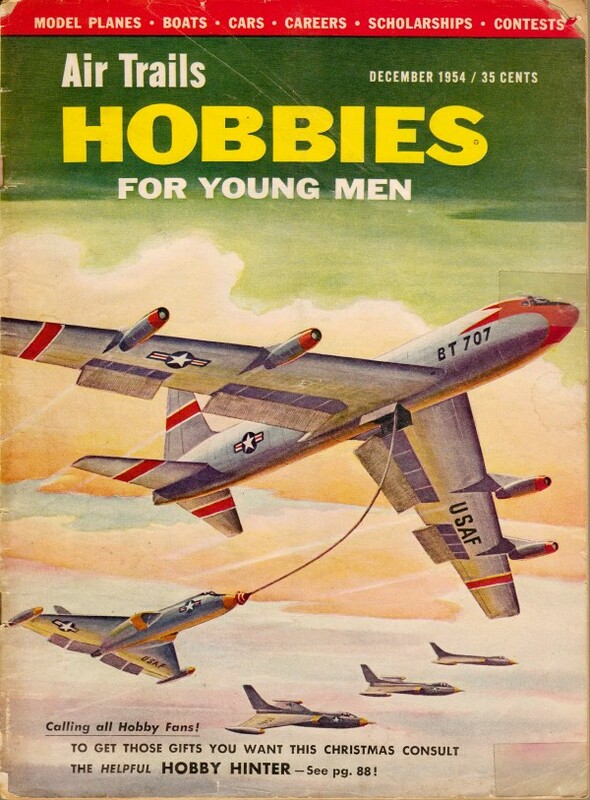 Air Trails HOBBIES for Young Men magazine, which was published in the 1950s and 1960s, covered a wide array of subjects including model cars, boats, trains, rockets, and helicopters. It may have billed itself as targeting young men, but men of all ages enjoyed its monthly contents. 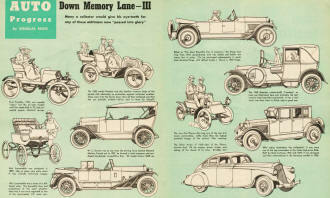 The December 1945 edition had this spread on some early cars such as the Pierce Silver Arrow and 1922 Durant. The image of line drawings and brief descriptions would also make a good wall poster if you want to print it out. If you are a vintage car aficionado, then most likely you have visited the Jay Leno's Garage website. He has one of the nicest private collections of antique automobiles and motorcycles in the world. 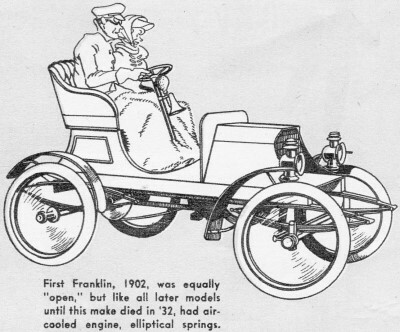 Many a collector would give his eye-teeth for any of these old-timers now "passed into glory"
First Franklin, 1902, was equally "open," but like all later models until this make died in '32, had air cooled engine, elliptical springs. The 1902 model Peerless had the familiar tonneau body of the period with absolutely no protection against inclement weather. 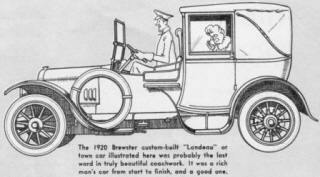 These were truly the heroic days when all that mattered was that the car actually worked - driver had to fend for himself! 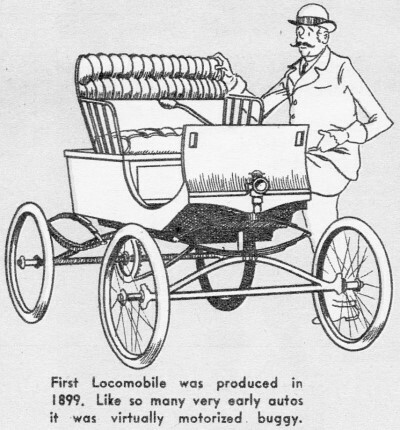 First Locomobile was produced in 1899. 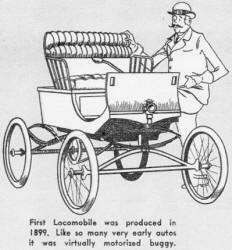 Like so many very early autos it was virtually motorized buggy. 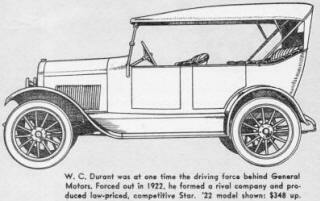 W. C. Durant was at one time the driving force behind General Motors. Forced out in 1922, he formed a rival company and produced low-priced, competitive Star. 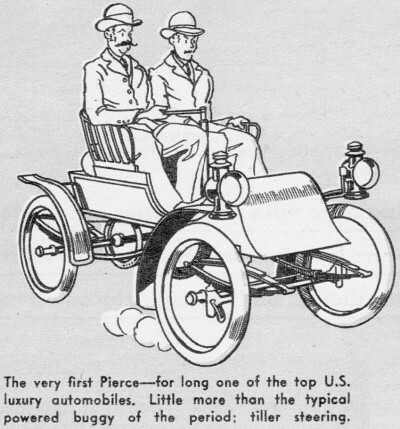 '22 model shown: $348 up. 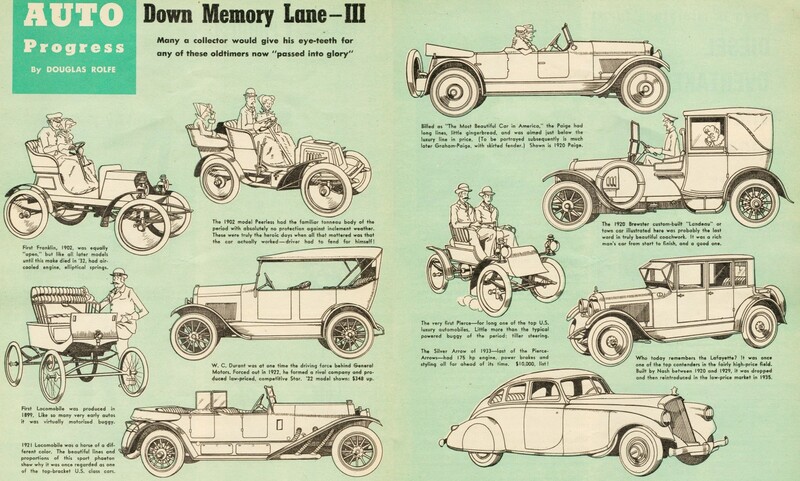 1921 Locomobile was a horse of a different color. The beautiful lines and proportions of this sport phaeton show why it was once regarded as one of the top-bracket U.S. class cars. 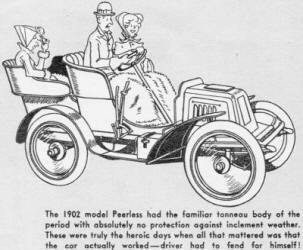 Billed as ''The Most Beautiful Car in America," the Paige had long lines, little gingerbread, and was aimedd just below the luxury line in price. (To be portrayed subsequently is much later Graham-Paige, with skirted fender.) Shown is 1920 Paige. The 1920 Brewster custom-built "Landeau" or town car illustrated here was probably the last word in truly beautiful coachwork. It was a rich mans car from start to finish, and a good one. The very first Pierce - for long one of the top U.S. luxury automobiles. Little more than the typical powered buggy of the period; tiller steering. The Silver Arrow of 1933 - last of the Pierce-Arrows - had 175 hp engine, power brakes and styling all far ahead of its time. $10.000, list! 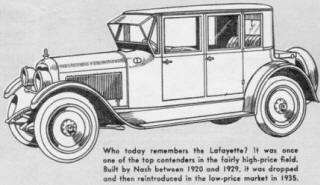 Who today remembers the Lafayette ? It was once one of the top contenders in the fairly high-price field. 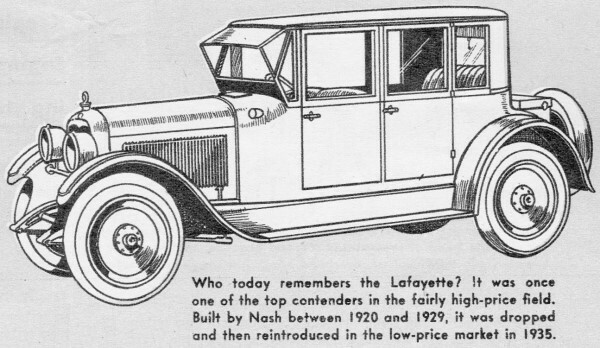 Built by Nash between 1920 and 1929, it was dropped and then reintroduced in the low-price market in 1935.